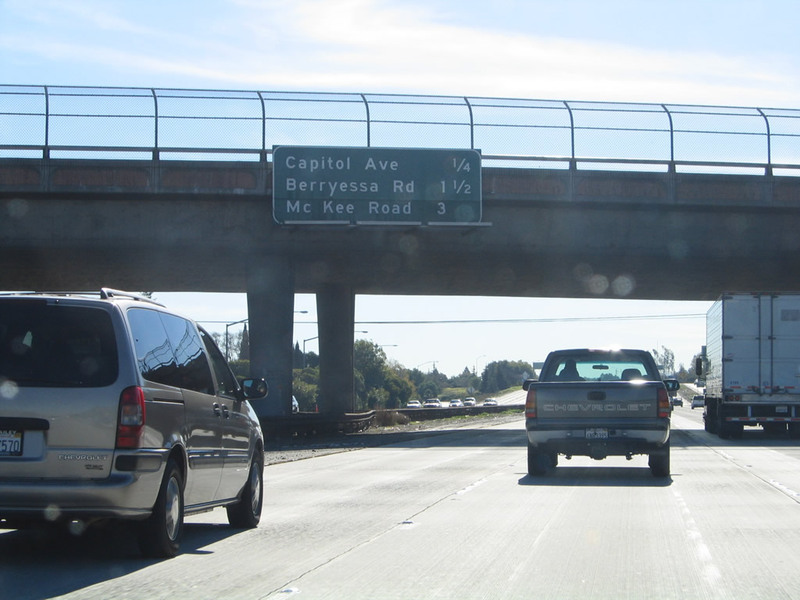 Crossing from Alameda County into Santa Clara County, the next three exits along Interstate 680 south are: Exit 9, Jacklin Road; Exit 8, California 237 (Calaveras Boulevard) to Central Milpitas; and Exit 6, Landess Avenue and Montague Expressway. 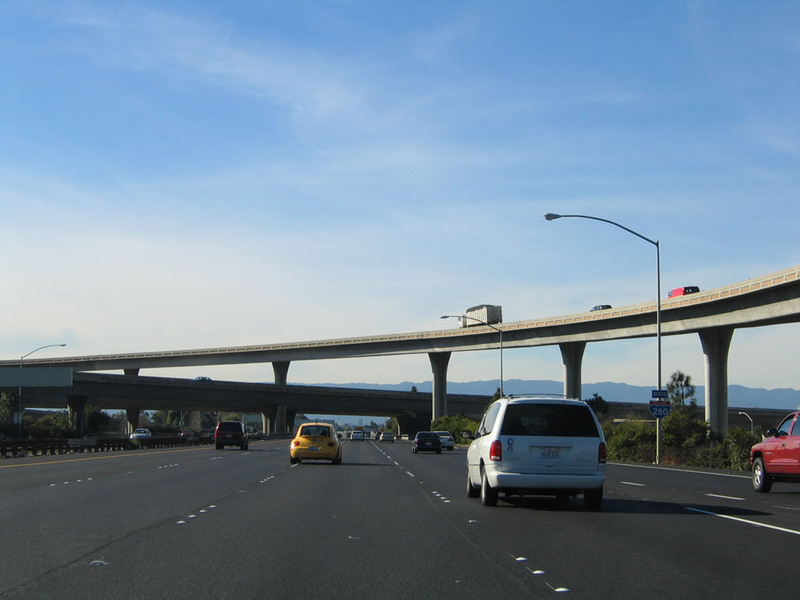 At this point, Interstate 680 leaves the city of Fremont and enters the city of Milpitas. 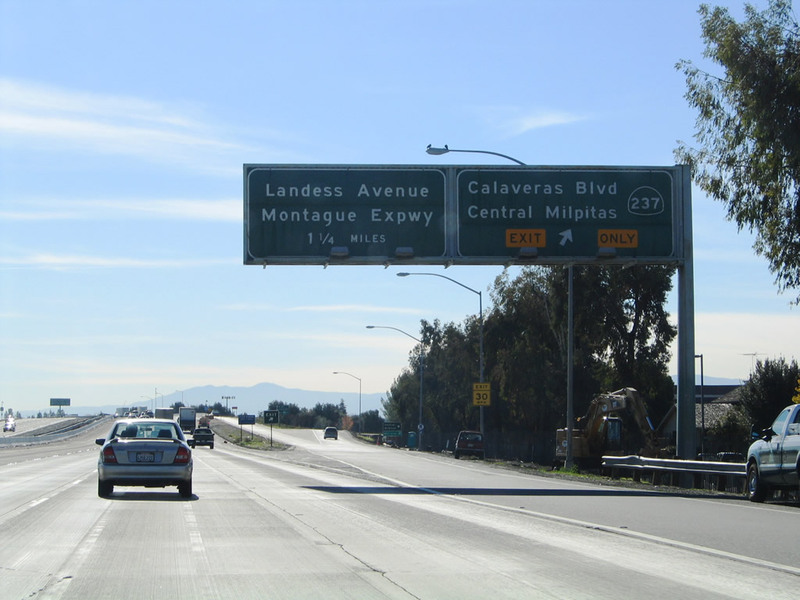 Situated on Interstate 680, Interstate 880, and California 237, Milpitas is known as the "Crossroads of Silicon Valley" with its freeway access. Home to 62,698 people as of the 2000 Census, Milpitas was incorporated as a city on January 26, 1954, as it was threatened with potential annexation by the city of San Jose. Milpitas is the first city along Interstate 680 in Santa Clara County after leaving Alameda County; this county line is demarcation point between the regional nomenclature of "East Bay" and "South Bay." Photo taken 11/29/04. 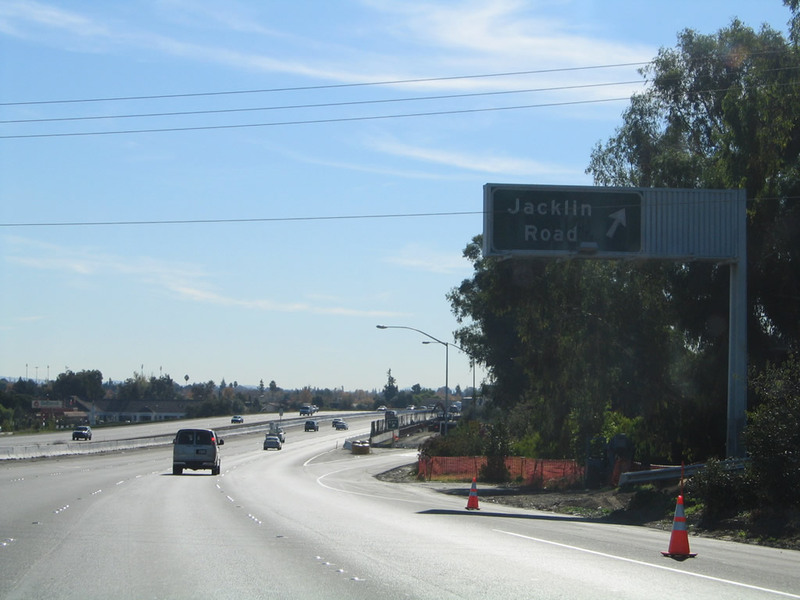 The right lane of Interstate 680 (Sinclair Freeway) south becomes exit only for Exit 9, Jacklin Road. Photo taken 11/28/10. 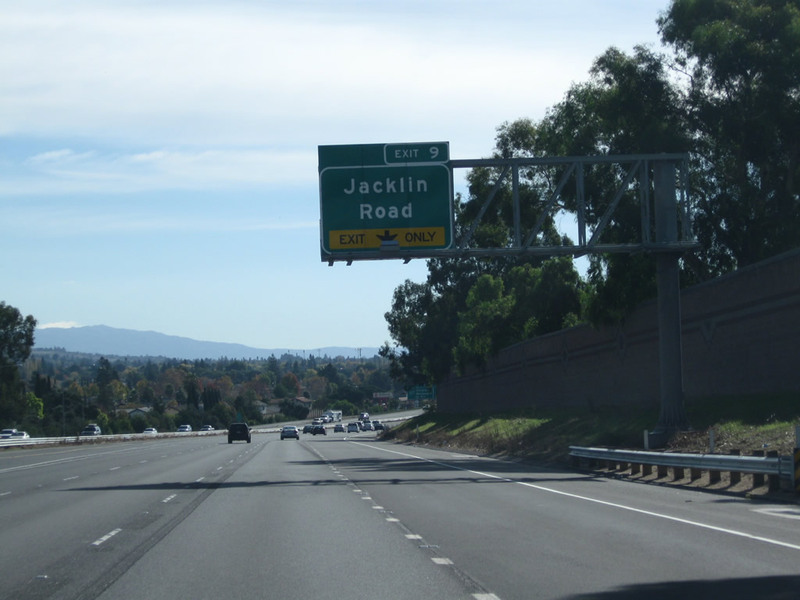 Southbound Interstate 680 (Sinclair Freeway) reaches Exit 9, Jacklin Road. The sign here was replaced at the same time the Express Lane was installed. The Express Lane will end between the Jacklin Road interchange and California 237 interchange. Photos taken 11/28/10 and 11/29/04. 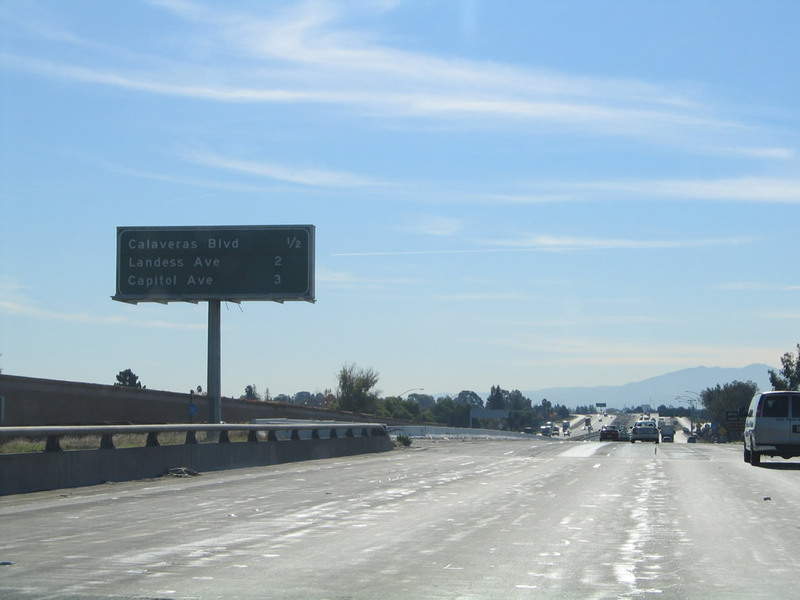 The next three exits along southbound Interstate 680 are: Exit 8, California 237 (Calaveras Boulevard) to Central Milpitas; Exit 6, Landess Avenue and Montague Expressway; and Exit 5, Capitol Avenue and Hostetter Road. Photo taken 11/29/04. 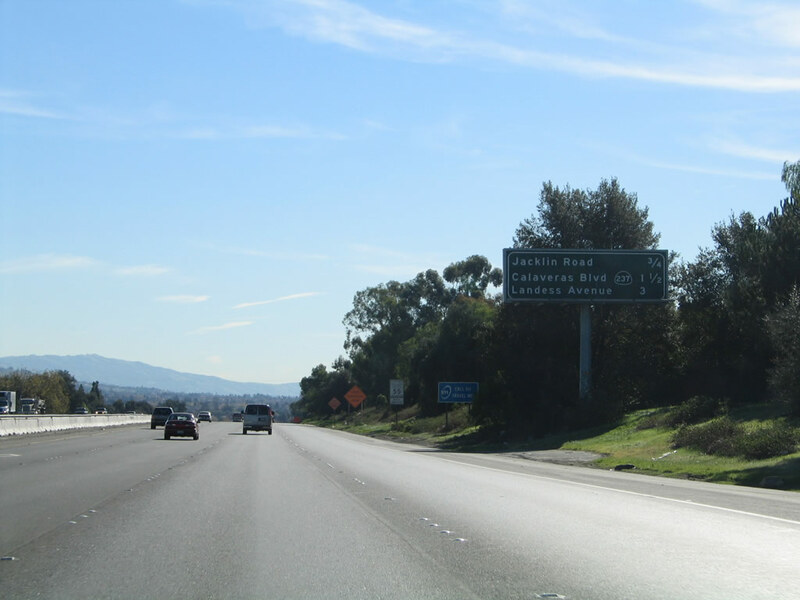 The right lane of southbound Interstate 680 becomes exit only for Exit 8, California 237 (Calaveras Boulevard) west. California 237 is an east-west state route that connects Interstate 680, Interstate 880, and U.S. 101. 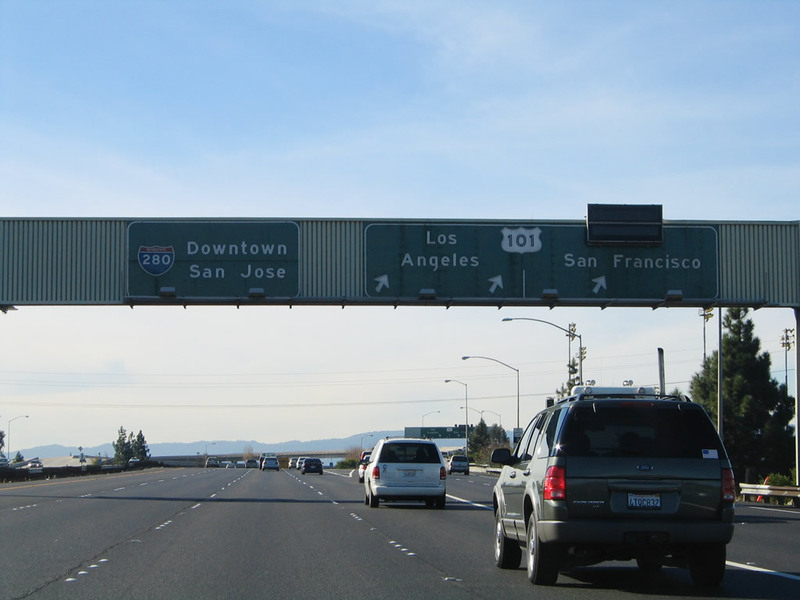 The portion between Interstate 880 and U.S. 101 is a freeway. Photo taken 11/29/04. 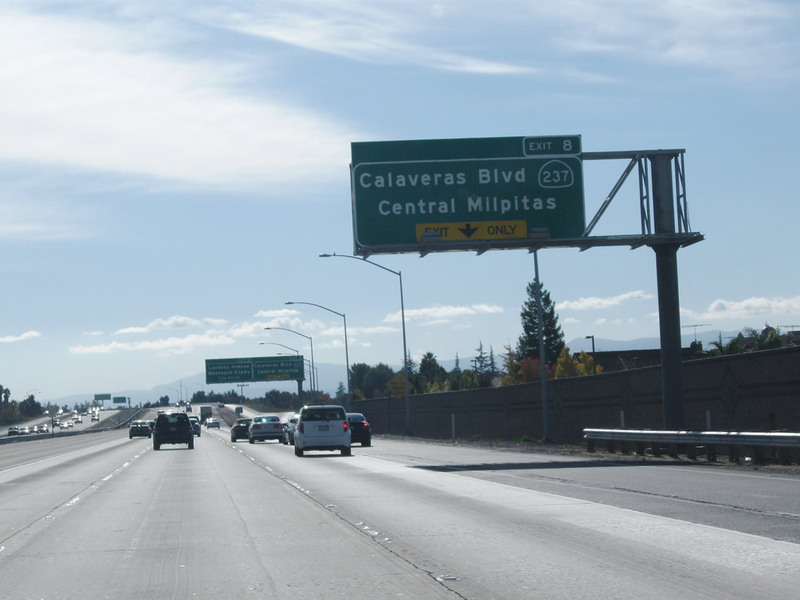 Southbound Interstate 680 (Sinclair Freeway) reaches Exit 8, California 237 (Calaveras Boulevard) to Central Milpitas. This interchange marks the eastern terminus of this state highway, so Calaveras Boulevard east of here is not part of California 237. However, it passes through Milpitas, connects to the southern end of Ed R. Levin County Park, and then swings north as Calaveras Road past Calaveras Reservoir before reconnecting with Interstate 680 at the California 84/Sunol interchange in Alameda County. As for California 237, it is a major east-west corridor from Interstate 680 west to U.S. 101. 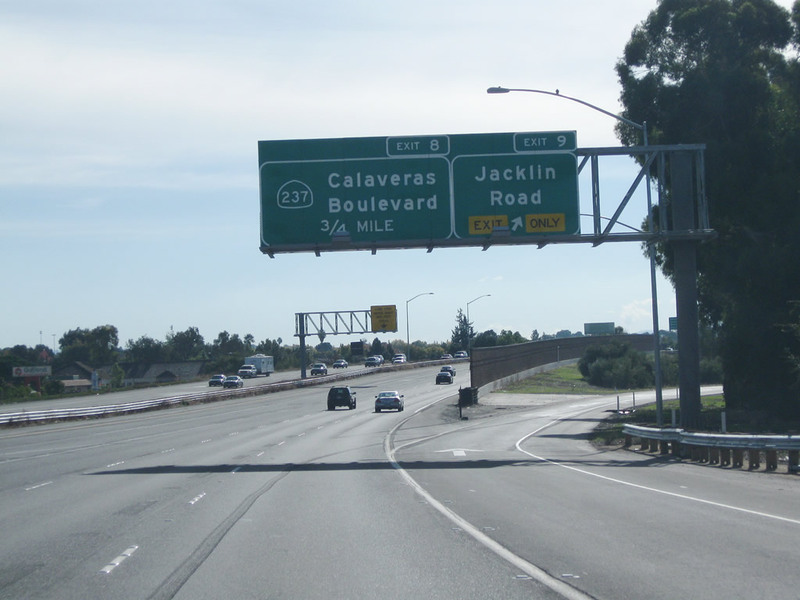 The first section, from Interstate 680 to Interstate 880, is a surface street (Calaveras Boulevard), but the state highway from Interstate 880 west to U.S. 101 is the South Bay Freeway. Photos taken 11/28/10 and 11/29/04. The next two exits along southbound Interstate 680 are Exit 6, Landess Avenue and Montague Expressway and Exit 5, Capitol Avenue and Hostetter Road. 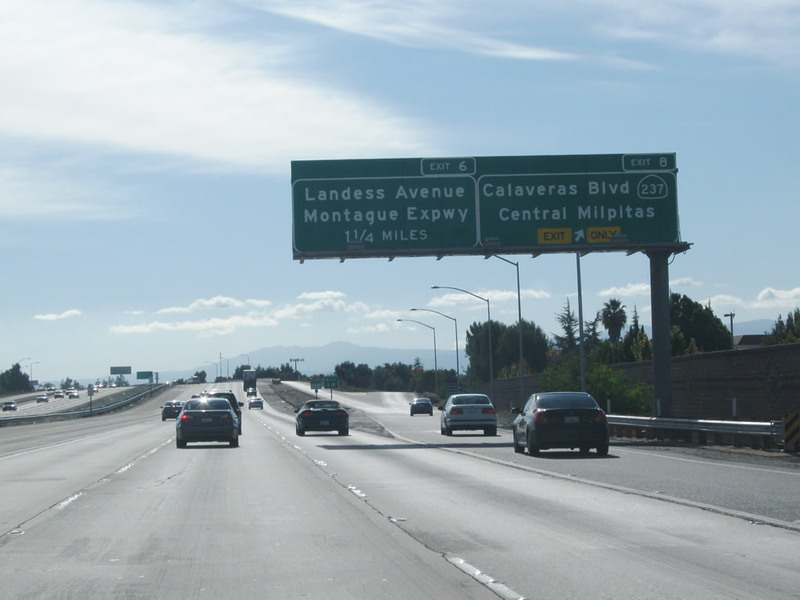 The Exit 6 interchange is a cloverleaf, and at that interchange, Interstate 680 will leave the city of Milpitas and enter the city of San Jose, which is the 10th largest city in the United States and 3rd largest in California (after Los Angeles and San Diego). As of the 2000 Census, 894,943 people lived in San Jose, which is also the seat of Santa Clara County and the capital of Silicon Valley. San Jose has been around since the mission days, having been founded on November 29, 1777. On March 20, 1850, San Jose became the first incorporated city in the state of California. While some spell San Jose with an accent mark (San Jos-) as a result of a City Council action in 1979, the original voter-approved city charter still spells the city name with an "e" rather than "-," so we'll use that spelling ("San Jose") here. Photo taken 11/29/04. 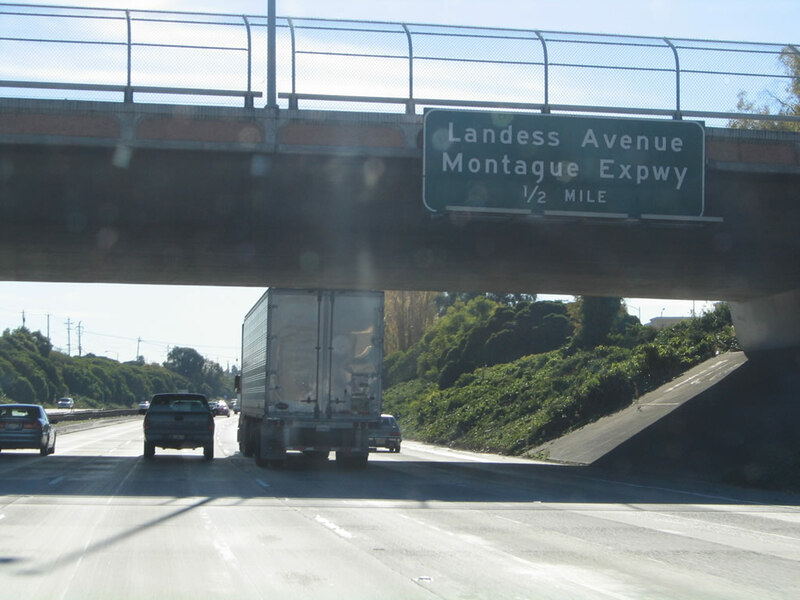 While Landess Avenue travels east toward Piedmont Drive, the Montague Expressway travels west past the Great Mall, then connects with Interstate 880. It is one of several direct connections between Interstate 680 and Interstate 880 in Milpitas (the others are California 237 (Calaveras Boulevard) and California 262 (Mission Boulevard)). Photo taken 11/29/04. 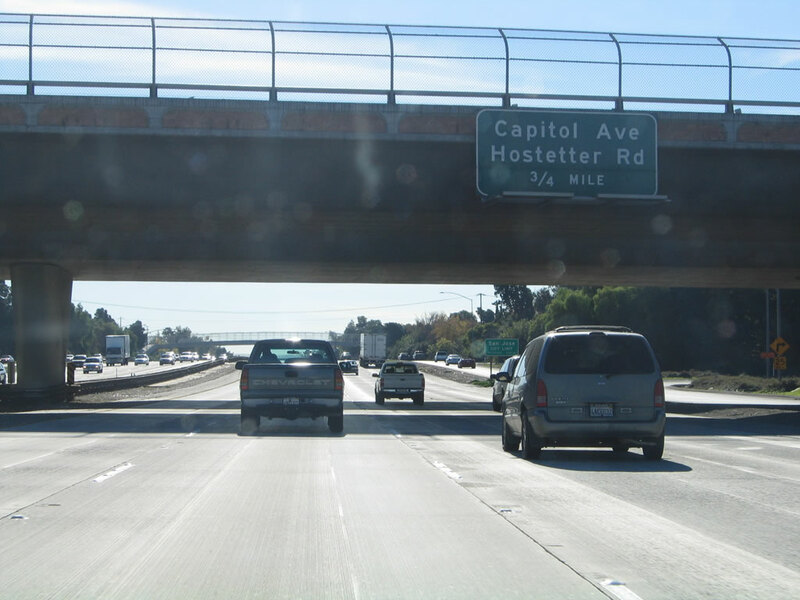 The next exit along southbound Interstate 680 is Exit 5, Capitol Avenue and Hostetter Road. Photo taken 11/29/04. This mileage sign along Interstate 680 south provides the distance to the next three exits along southbound Interstate 680: Exit 5, Capitol Avenue and Hostetter Road; Exit 4, Berryessa Road; and Exit 2B, McKee Road. Photo taken 11/29/04. 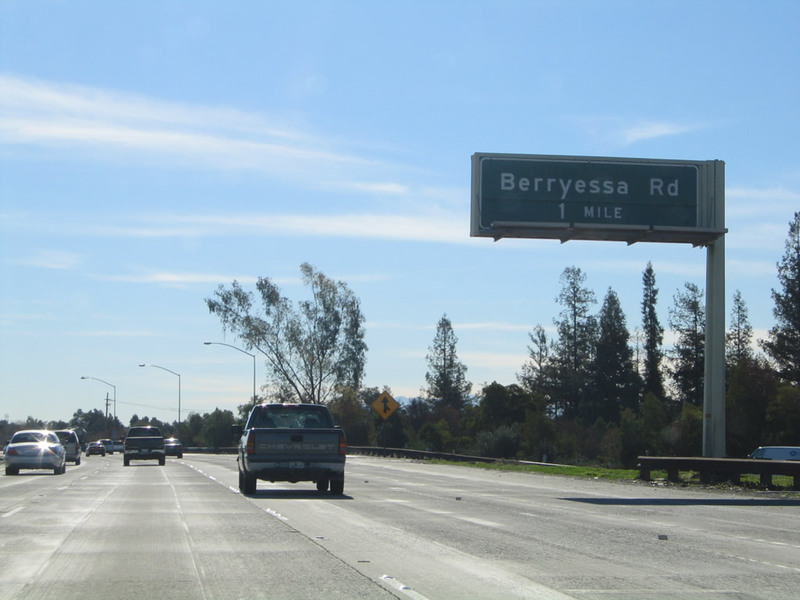 The next exit along southbound Interstate 680 is Exit 4, Berryessa Road. Photo taken 11/29/04. 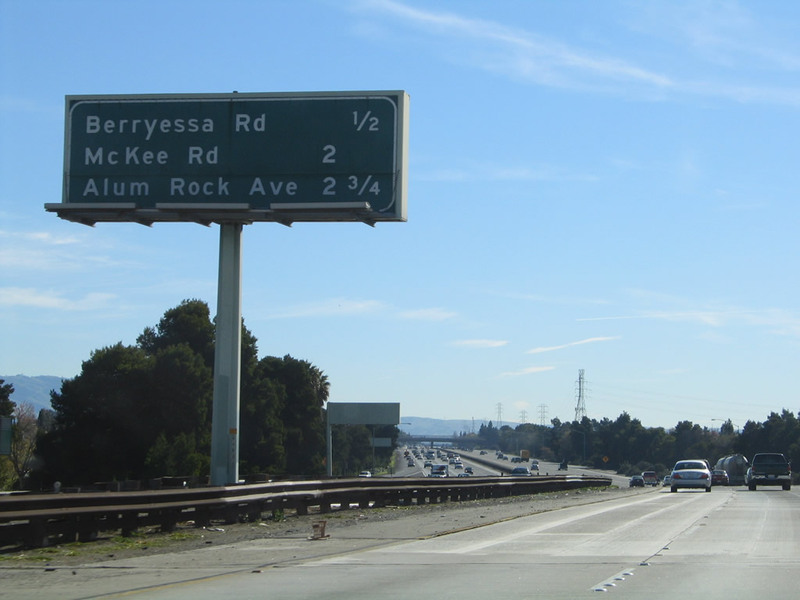 This mileage sign along Interstate 680 south provides the distance to the next three exits along southbound Interstate 680: Exit 4, Berryessa Road; Exit 2B, McKee Road; and Exit 2A, California 130 (Alum Rock Avenue). Photo taken 11/29/04. 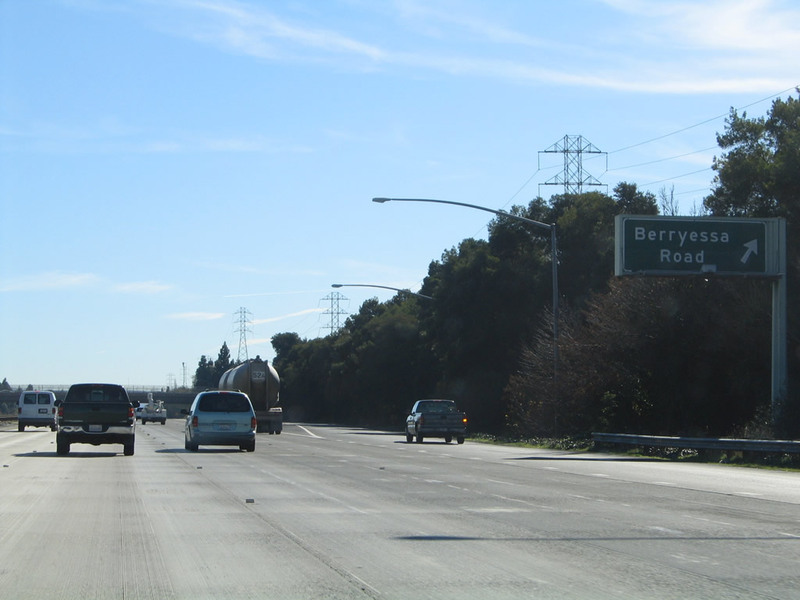 Southbound Interstate 680 reaches Exit 4, Berryessa Road. The next two exits are Exit 2B, McKee Road and Exit 2A, California 130 (Alum Rock Avenue). Photo taken 11/29/04. 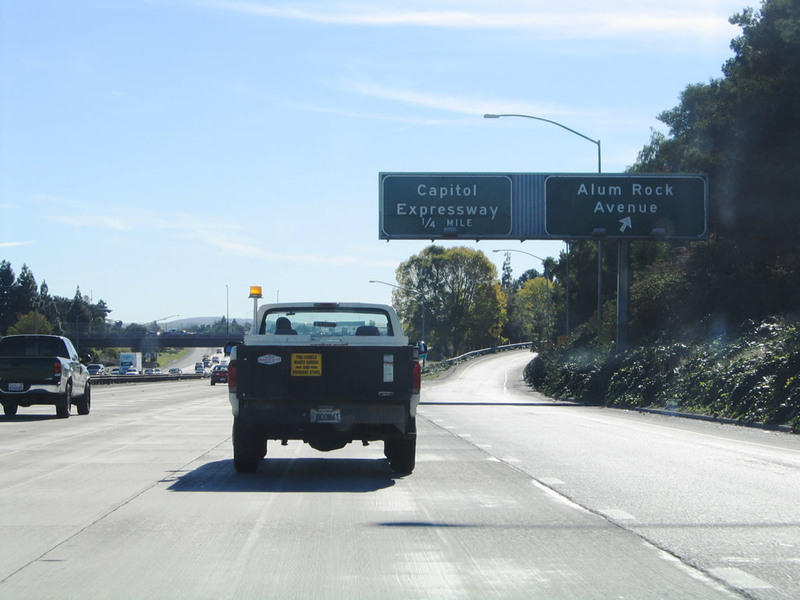 This mileage sign along Interstate 680 south provides the distance to the next three exits along southbound Interstate 680: Exit 2B, McKee Road; Exit 2A, California 130 (Alum Rock Avenue); and Exit 1D, Capitol Expressway. Photo taken 11/29/04. 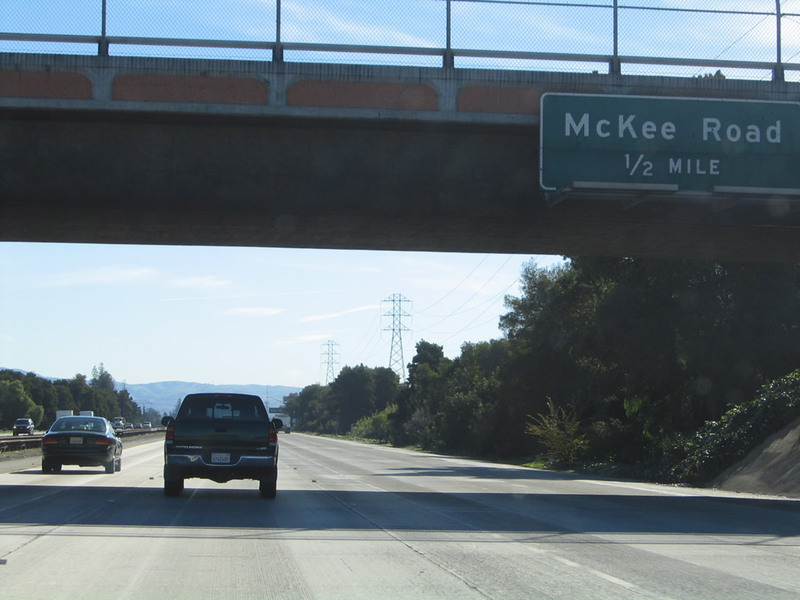 The next exit along southbound Interstate 680 is Exit 2B, McKee Road. 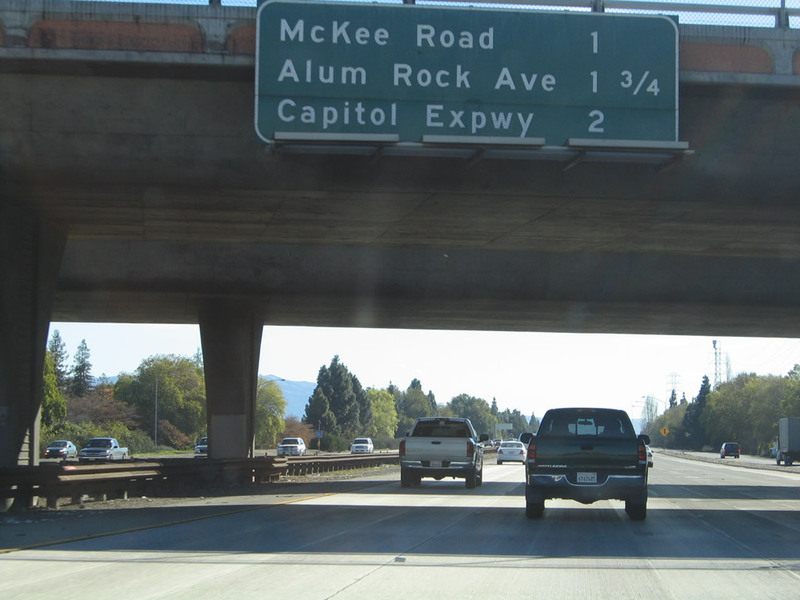 The next two exits, which also serve San Jose, are Exit 2A, California 130 (Alum Rock Avenue) and Exit 1D, Capitol Expressway. Photo taken 11/29/04. 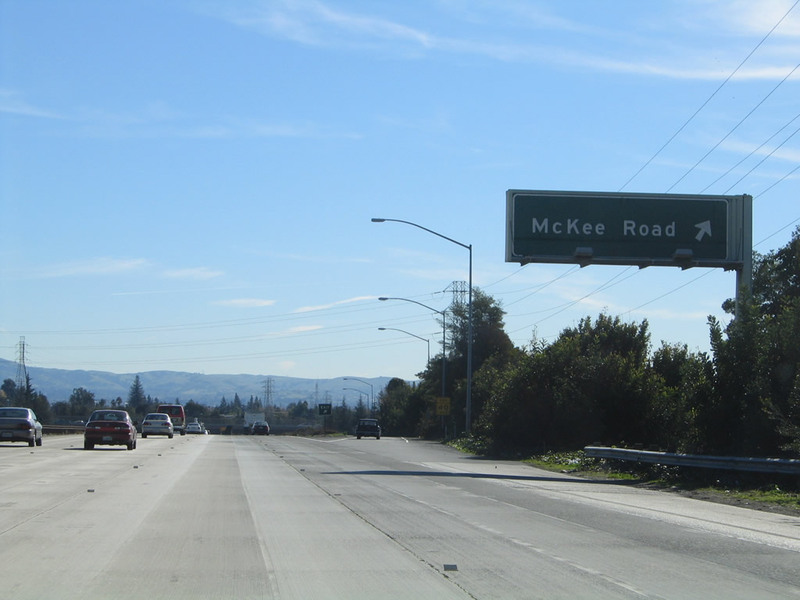 Southbound Interstate 680 (Sinclair Freeway) reaches Exit 2B, McKee Road. Photo taken 11/29/04. The first signage for the final interchange on Interstate 680 appears on a roadside sign near the collector distributor lane at McKee Road interchange. An overhead sign would be more appropriate. 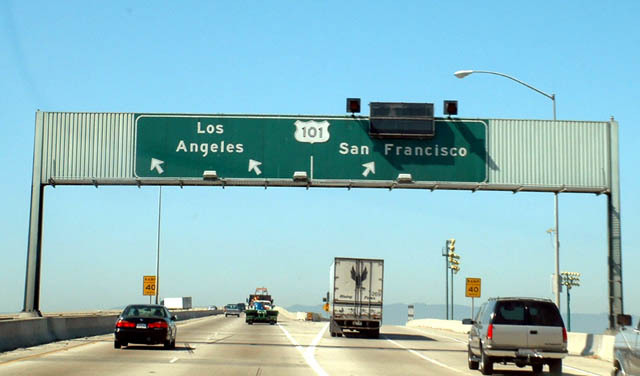 Exit 1B serves as the connection from Interstate 680 south to U.S. 101 north to San Francisco and south to Los Angeles via San Luis Obispo. Photo taken 11/29/04. 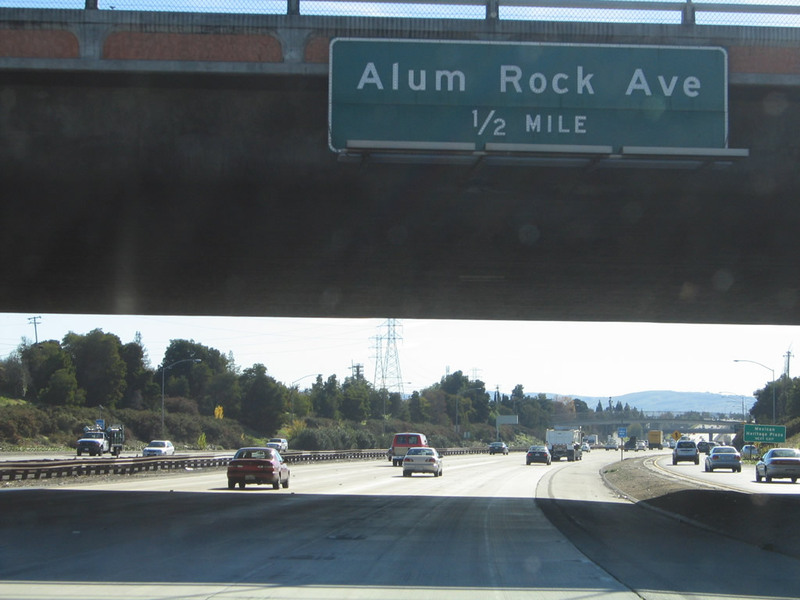 The next exit along southbound Interstate 680 (Sinclair Freeway) is Exit 2A, California 130 (Alum Rock Avenue). 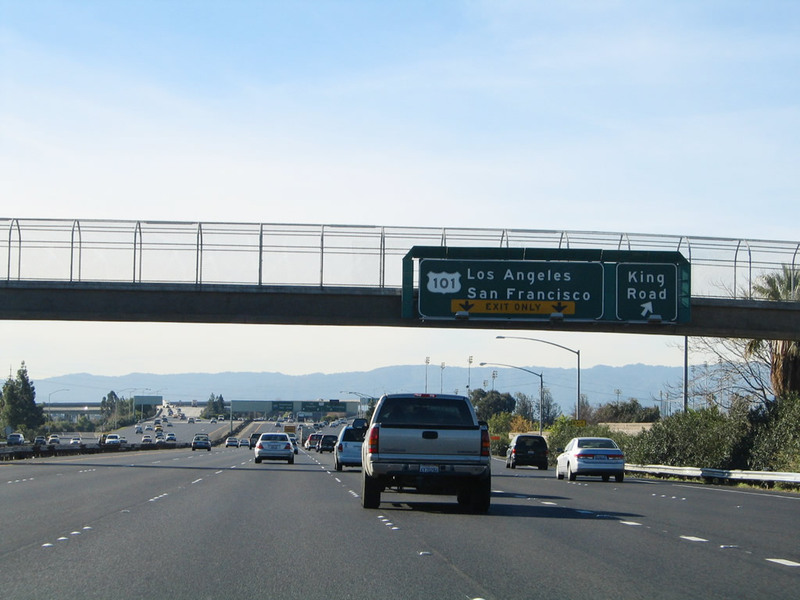 California 130 extends west along Alum Rock Avenue to U.S. 101 (Bayshore Freeway), where the state highway ends. To the east, California 130 follows Alum Rock Avenue to unincorporated Alum Rock and East San Jose before transitioning onto Mount Hamilton Road. From there, California 130 begins a long, winding journey from the Silicon Valley floor to Mount Hamilton (el. 4,213 feet) and the University of California&apos;s Lick Observatory. From there, California 130 ends, and San Antonio Valley Road and Del Puerto Road continue east as County Route 130 to meet Interstate 5 near Patterson. While this drive might look like a short cut on a map, it is actually a two to three hour drive on a good-weather day. Note the absence of California 130 shields on this overhead sign. Photo taken 11/29/04. Southbound Interstate 680 (Sinclair Freeway) meets Exit 2A, California 130 (Alum Rock Avenue) in San Jose. Photo taken 11/29/04. 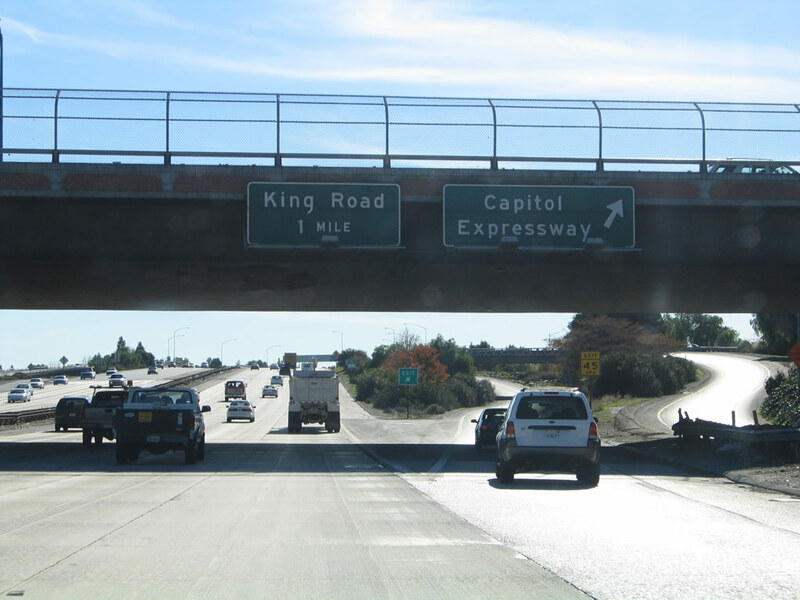 The next exit along southbound Interstate 680 (Sinclair Freeway) is Exit 1D, Capitol Expressway. There is quite a maze of ramps here as traffic merges onto the freeway from Capitol Expressway. Despite its name, the Capitol Expressway is not as fast as the freeway since there are traffic signals along the expressway. Photo taken 11/29/04. Southbound Interstate 680 next reaches Exit 1C, King Road. 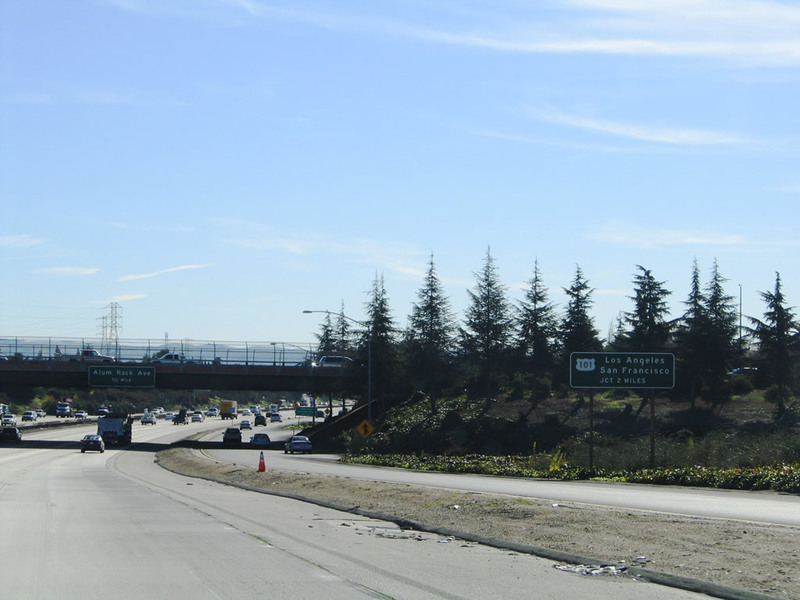 The right two lanes will become exit only for Exit 1B, U.S. 101 (Bayshore Freeway), while the left four lanes will connect directly onto Interstate 280 (Sinclair Freeway) west to downtown San Jose. Interstate 680 ends in the shadow of the massive stack interchange with U.S. 101 and Interstate 280. Photo taken 11/29/04. Interstate 680 south comes to its end at this point, where the right lanes exit onto northbound and southbound U.S. 101 and the mainline continues straight ahead as northbound Interstate 280 in San Jose. Photo taken 11/29/04. At the top of the transition ramp from southbound Interstate 680 onto U.S. 101 at Exits 1A-B is this sign, pointing the way to northbound and southbound U.S. 101 near downtown San Jose. Photo taken 08/19/03. 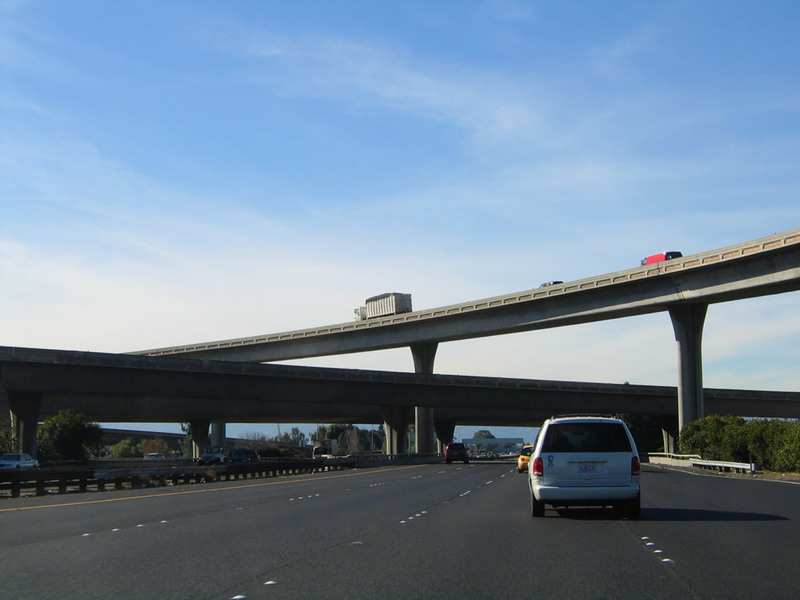 The massive stack interchange between Interstate 680, Interstate 280, and U.S. 101 rises above the Sinclair Freeway. A reassurance shield for Interstate 280 north is posted here, even though we are traveling in a southwesterly direction here. Photos taken 11/29/04. Page Updated November 22, 2011.